RadVC's "Single Click Setup" takes the worries of managing traditional C++ controls out of you and make their assembly and deployment a snap. The RAD C++ control ("Circle") we made in the Control Development Kit (CDK) consists of many different type of files. The control is declared in a header file called "Circle.h", implemented in "Circle.cpp" and its resources are defined and described in "Circle.rh" and "Circle.rc". As discussed in the CDK, this "source" type of controls provide the maximum flexibility in component reuse, since the user has the freedom to not only extend / inherit the control functionality but also he / she can modify its very source code. However problem arises while deploying this kind of "source" controls in the user's system, since the user has to copy these files manually one by one to his or her system. One easy solution of avoiding the complexity of managing these different type of source files is to create an ActiveX control out of the C++ control. An ActiveX control consists of only one file ("circle.ocx"), but this largely prohibits the task of extending the control functionality (a term called "implementation inheritance"). Furthermore, the user of the control has to make sure that the control is registered in his / her system for this to work properly. The issue of "implementation inheritance" with the ActiveX type of controls can be resolved by creating a MFC extension control, but with this type of controls, the user won't be enjoying the freedom of manipulating the control source code. Again, the user needs to make sure that the control libraries (a .lib and a .dll file) are deployed in his / her system. Thus in summery, in whatever form (source / ActiveX / library) we decide the controls should be distributed to the user's system, we need to make sure that they are packaged / assembled properly with the right set of files on our (control publisher) end, and also they are deployed / installed properly in the user's machine in their original forms. RadVC's "Single Click Setup" technology simplifies this job of assembly and deployment by creating one single setup file. The setup files for RAD C++ controls are nothing but self-extracting executables that archive various files related to a single RAD C++ control. These setup files install themselves automatically in the clients machine by extracting the component files to the client's machine and performing additional jobs such as control registration and inserting them into the RadVC toolbox. The files shown in the list control (under the header "Files") are the files that going to be archived in a setup file called "circle.exe". You can edit / change the name and location of this file by clicking the browse button with caption ("..."). To add additional files to the archive, click on the button with caption '+' and then browse the files to add. For example, if your source type control uses a helper class then you need to add the file(s) that declares and implements that class. Also use this option when you create a setup file for a "Library" type control. In this case you need to add the library files (.lib and .dll) to the archive. To remove any unnecessary files from the archive files, select the file in the list control and click on the button with '-'. For example, if we have made an ActiveX control from the C++ control, the file list will display the ActiveX control file ("Circle.ocx") and an interface header file called "iCircle.h". Thus if we decide to create a setup file for a "source" type control, we should remove these two files, since the user can always create those files by using the "Single Click ActiveX" option. The following table displays the name of files for different type of RAD C++ controls. 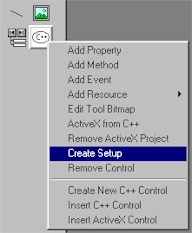 Once you finish adding / removing the files from the file list, then click on the "Archive" button, this will create the setup files for the RAD C++ control, "Circle.exe" as shown below.